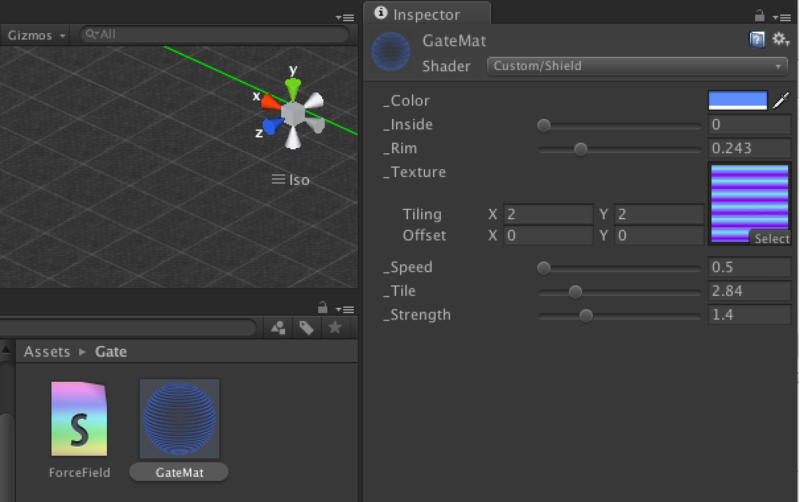 For force field itself, I need a shader that create force fieldish look. Luckily, there is something fist to this definition: http://wiki.unity3d.com/index.php?title=Shield. Lets start with material for the force field. Figure below shows the set-up. I also want to be able to warn when the force field is starting; eg. after malfunction I want to be able to give a visual hint that force field is starting. 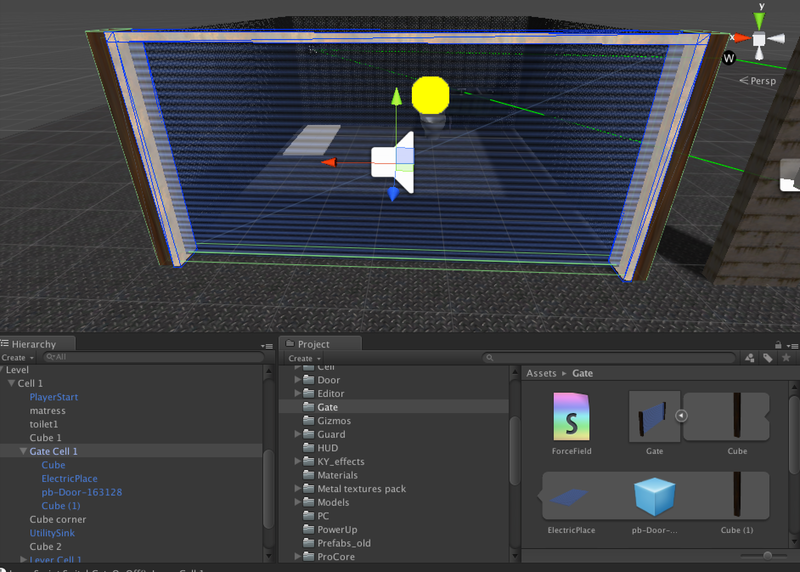 For that I create frame for the force field (in this case I created a door object with Prototype / ProCore Unity add-on). For the gate frame I create material that has emission material. I also add couple of boxes to as the right and left ends of the gate. Now I have gate object created and it looks as in Figure below. ElectricPlane (should have renamed it to ForceField) needs two box colliders. One very narrow just covering the plane and one bigger that is set to trigger. I also need a model for lever that can used to control the force field gate that has animated lever (the model & animations used in this example by Andreas Jansson). For the lever, I need an AnimatioController. Figure below shows the state machine and parameters. LevelAnimation and Backwards are connected to animations. NewState is an empty state so that nothing happens when scene starts. 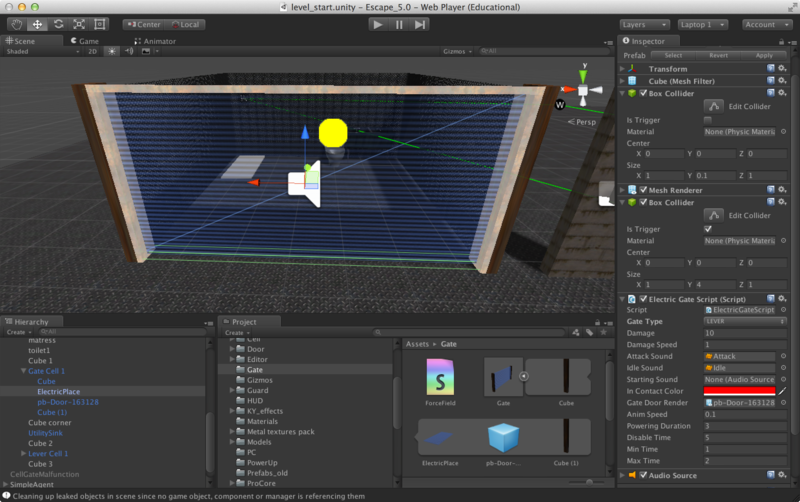 TiltForward is transition condition from Any State to LevelAnimation and TiltBackward to Backwards. The cases 1, 2, 4 requires that gate has lever associated. 3 does not need lever and if it has the lever might not work correctly. // can be damaged by the force field. Following figure show a set-up for the script as well as the gate object. 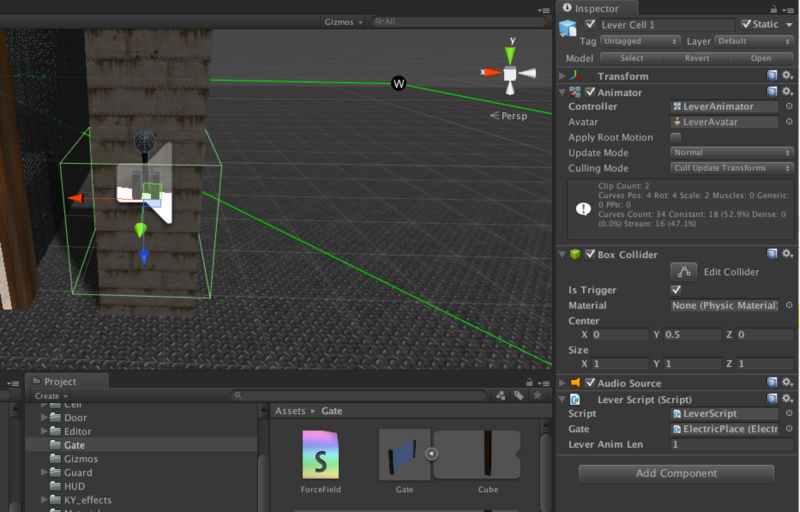 Lever object need also a box collider that is in trigger mode. Make sure that collider is big enough so that the PC can collide with that. Following figure shows a set-up for a lever. I plan to start game so that the PC is in cell and after a short while the force field of the cell starts to break. To do that I need one more script that changes the cell gate from LEVER to BREAKING. Attach the script to an empty game object and drag-and-drop ElectricPlane to CellGateMalfunctions script’s cellGate.